Subculture is lurking just below the surface, flying under the radar of mainstream tastes and accepted smoking traditions. Subculture is for hard-core only. 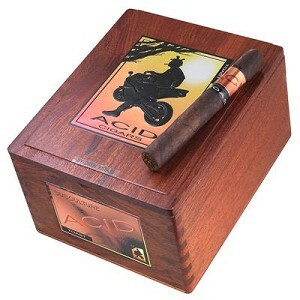 Acid Subculture Ronin blends are born from the ultimate expression of craft and art. These limited edition cigars are granted to only most deserving and devout retailers across the nation who spread our call, The Rebirth of Cigars. Each Subculture is one onto it’s own, so seek them out and be rewarded with the fruits of our labor of love, creating the most fantastic cigars the world has ever seen. The list below contains subculture sizes which may or may not be currently available. You must be persistant & diligent in your hunt to secure them, as many scatter throughout the country landing in obscure shops in the far reaches of society….